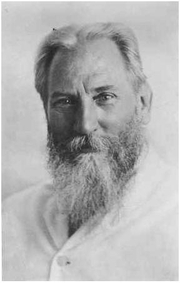 C. W. Leadbeater (February 16, 1854 Stockport, Cheshire, England - March 1, 1934 Perth, Western Australia), was an English clergyman, author, clairvoyant, and prominent early member of the Theosophical Society. His interest in occultism was stimulated by A.P. Sinnett's book, "Occult World", and he joined the Theosophical Society in 1883. The next year he met Helena Petrovna Blavatsky when she came to London. "When she accepted him [as a pupil], he gave up the church, became a vegetarian, severed all ties with England, and followed her to India." At this time he was the recipient of a few Mahatma letters which influenced him to go to India, where he arrived at Adyar in 1884. In India he wrote that he had received visits and training from some of Blavatsky's Masters. This was the start of a long career in the Theosophical Society. NOTE: Leadbeater's date of birth of February 16, 1854 was given in the English census of 1861, 1871 and 1881. After his mother died, in May 1882, his date of birth was given as 17 February 1847 and it appears in the 1891 census. This was also the date he used in his passport. His reason for using a different date of birth is not known, although research about it continues. C. W. Leadbeater is currently considered a "single author." If one or more works are by a distinct, homonymous authors, go ahead and split the author. C. W. Leadbeater is composed of 11 names. You can examine and separate out names.